Poosanikai/Ash gourd/White pumpkin is a vegetable which is rich in water content. 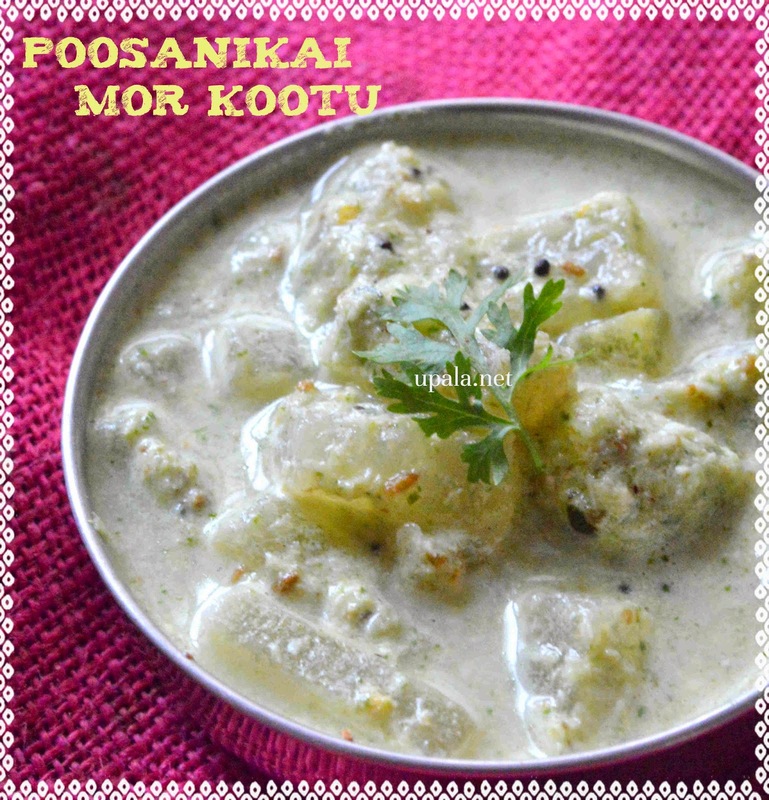 There are lots of recipes prepared using this poosanikai such as poosanikai puli kootu, poosanikai curry, in this post we will see one such traditional recipe "Posanikai mor kootu". Poosanikai puli kootu is also traditional kootu which is prepared using tamarind. 1) Remove the seeds and peel the outer green skin of poosanikai and chop them as cubes. 2) Heat oil in a kadia and add mustard seeds. After it crackles add curry leaves and Poosanikai. Fry for few secs in low flame. 3) Add water and salt to poosanikai and let it cook until it becomes soft. 4) Meantime grind the ingredients given and keep aside. 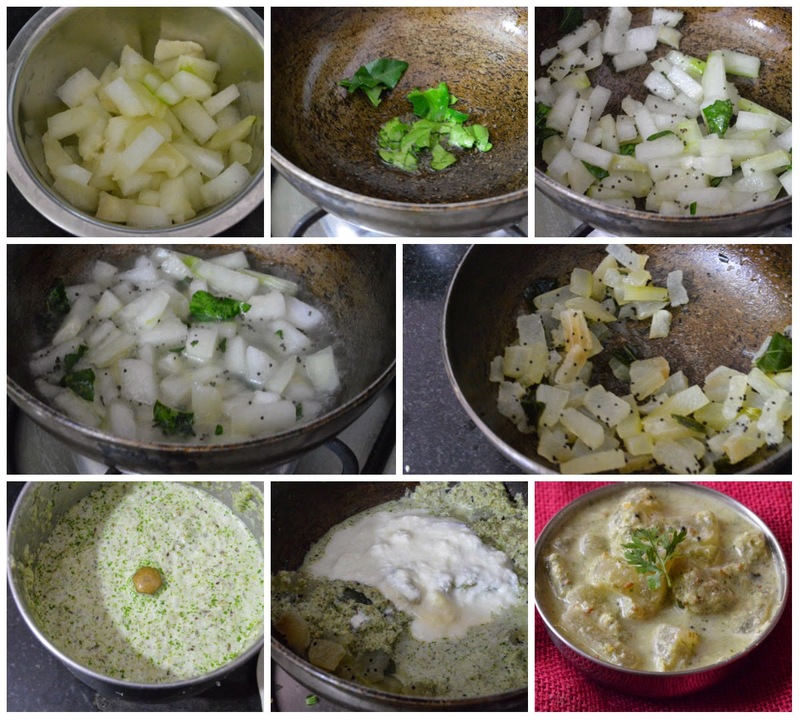 5) Add the ground mixture and curd to poosanikai after it is cooked. 6) Let it boil for 5 mins in low flame and switch it off. 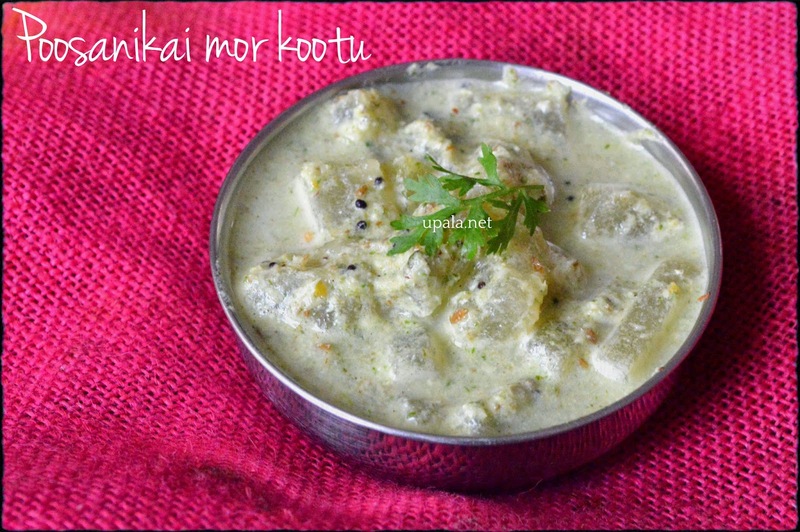 Tasty ash gourd mor kootu is ready. 1) Another method to cook is : Cooking poosanikai separately in water, adding ground mixture and curd. After it gets cooked, you can season and pour the mixture on top of kootu. 2) I prefer adding ginger and coriander leaves while grinding as it gives nice flavour of coriander and ginger along with coconut. You can grind coconut, cumin seeds and green chillies alone to get plain coconut flavour.